Petey is a good old dog. He lives with Joe in Boardman, Ohio. We were duplex neighbors when we all lived in Struthers. Joe granted permission for Petey to model “Fun Size” Pet Buttons so you can see that pets are great subjects for photo buttons. “Fun Size” buttons are 1.25″ dia. Back options include pins, fridge magnets, and flat back tokens. The metal back on tokens is steel color. In the photo, it looks black… I did not want to photo-shop the buttons, but I did white-wash the background and added text. Tokens are made to be glued onto things. They’re great for craft projects, greeting cards, all sorts of things. For the samples, I used hot glue to attach a token to a badge reel and double-sticky foam tape to make a planter stick. The two unattached to anything have strong ceramic magnets hidden inside. Something else I like about tokens… I can hide things inside. Of course, the contents must be added while the button is in the press and the only way to get it back out again is to destroy the button. There is enough space inside for a little note, a lucky coin, or whatever is small enough to fit in there. The larger 2.25″ buttons can also make nice pet photo buttons. Text is optional. I think I can post this now as Joe should have received his package in the mail today. I did not tell him about the token buttons. I also remodeled his badge reel sample, replaced the plastic strap with a detachable mini key ring, as the badge reels purchased online failed my quality control testing. I was thinking of offering badge reels as a product option, but some of those straps only have about a one snap life. So, I just sell the tokens and people can glue them onto whatever they want. Along with the pet button samples, Joe also got a surprise button because he found one of the misspelled words in Youngstown and commented about it on my Facebook page. 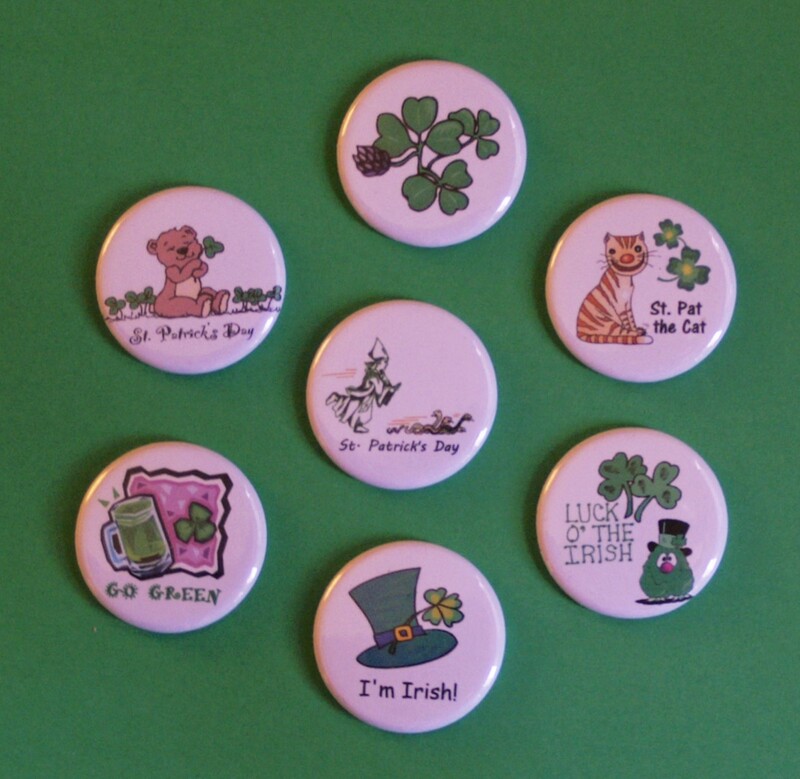 New button designs for Saint Patrick’s Day! The samples in the photo are tokens, but I will make pins and magnets to sell at the YWCA Art Sale on March 14 and 15, 2015. Source of clip art images: Art Explosion® 500,000 software from Nova Development.